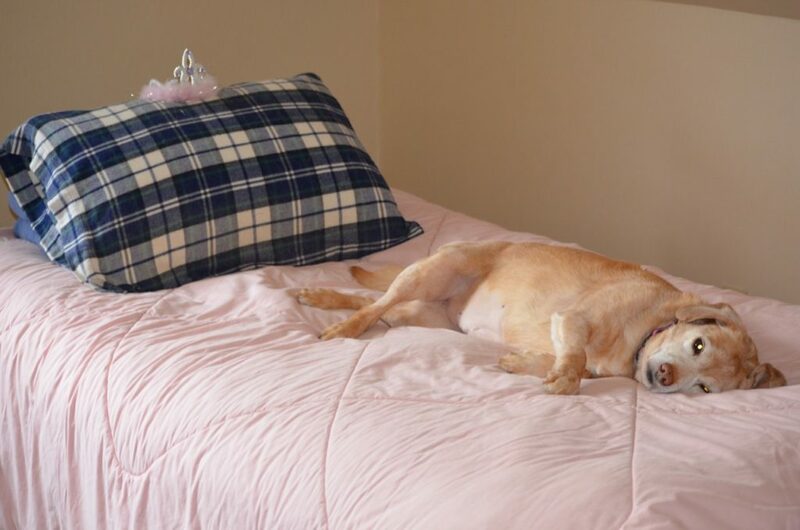 I took that photo about a week or so ago, after walking past Darla’s room upstairs and seeing her lying on a pink comforter with her pink tiara close at hand. “Pink Princess” is what came to mind. We took her sutures out a few days ago and her incision site looks good. So all we can do now is keep our fingers crossed, keep looking for more mast cell tumors, and manage her liver and kidney diseases the best we can. Of course, she’s not worried about any of this, making for a very happy Pink Princess! Darla joins us in wishing you a wonderful Thanksgiving holiday! Darla looks so content and that life is good. She has her own room and pink bed and a Mom & Dad who love her so very much not to mention her siblings. God bless you, Darla. She certainly looks like a sweet, innocent princess! But I suspect she harbors plans to chew on her tiara. 🙂 Happy Thanksgiving to you, Alayne, and all your furry family members. Sending tummy rubs to Darla and all the four-footeds at RDF, and wishes for a happy and peaceful Thanksgiving to you and Alayne! She looks so contented and comfy on the bed. There is nothing better than being next to a warm dog in the cold weather, rubbing their tummy. Happy Thanksgiving to you all. She looks so happy. This Thanksgiving I am thankful for wonderful people like you who help animals have good lives! Sweet Princess Darla!!! She looks so content. Not a care in the world!! Happy Thanksgiving to you, Alayne & all the fur kids. I’m thankful for people like you both. I join all the others in saying a big thank you for all you do to help your minion friends. They have a quality of life they wouldn’t have without you. Happy Thanksgiving to you and Alayne. We are thankful for you! Sweet Darla and loving guardians. Happy thanksgiving to you all. This sort of loving makes my day. Happy Thanksgiving to you all up there! All the animals in the world should have a life like Darla’s. Wishing you and Alayne and all the animals at Rolling Dog a wonderful Thanksgiving. I’m thankful that Rolling Dog Farm has made a wonderful home for so many dogs. You have huge hearts! And I’m thankful for all of the generous dog-loving supporters who help keep RDF rolling along! God bless you, and have a fantastic Thanksgiving! Oh sweet Darla! The pink comforter perfectly matches your pink tummy! Just hoping the surgeries are through now, for sure! We are so thankful for our wonderful pups, and for the Rolling Dog Farm being there for their special ones. Steve & Alayne, we are so very thankful for YOU. I can’t think of anyone more special. Happy Thanksgiving to all of the RDF supporters! She is such a BEAUTY! Thanks so much for sharing these lovely spirits with the world! The world is a better place because you two are in it!